Canton – Frankie Ada Collins Johnson, beloved mother, grandmother, great-grandmother and teacher, 97, passed away at Silver Bluff Village on Sunday, February 3, 2019. A native of Haywood County, she was born on August 20, 1921 to the late Frank and Connie Wood Collins. In addition to her parents she was preceded in death by her husband, Charles Smathers Johnson, who passed away in 1987 and a sister, Reva Collins. Frankie was a graduate of Canton High School Class of 1938 and Western Carolina Teachers College, Cullowhee, NC, Class of 1942 where she earned a Bachelor of Science Degree in Modern Languages. 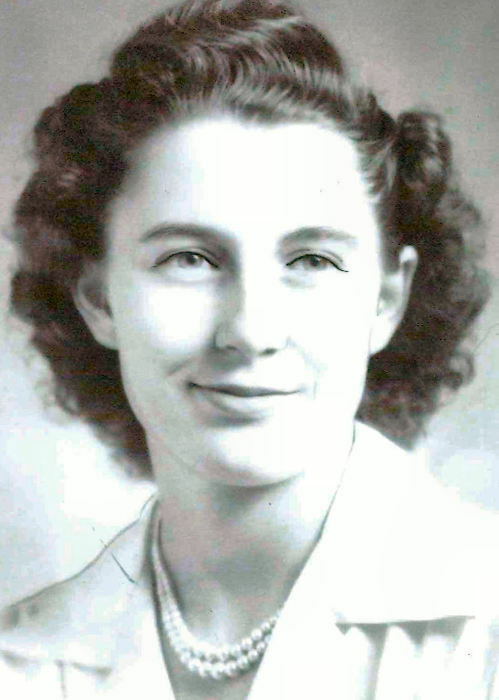 While attending WCTC she was the President of the International Student Society and was listed in the 1941-42 Edition of Who’s Who of American Colleges and Universities. She taught English at Canton High School and Pisgah High School and retired after having taught for 30 years. She was an avid Black Bear Fan and enjoyed all sports. Frankie loved spending time at Lake Fontana and Lake Chatuge also vacationing at Fort Myers Beach, Florida and Litchfield, South Carolina. She enjoyed playing bridge and spending time with her lunch bunch friends in Canton. She was a member of Canton First Baptist Church, Delta Kappa Gamma Society International, and was a volunteer at the Haywood County Hospital for many years. Surviving are two daughters, Jean Johnson Stahl and her husband, Ken, of Waynesville, and Jan Johnson Williams and her husband, Dan, of Salisbury; five grandchildren, Kendra Stahl Wilson (David) of Asheville, Gregory Johnson Stahl of Raleigh, Jeffrey Kendal Stahl (Angela) of Asheville, Corbin Williams Neuner (John) of Richmond, and Matt Williams (Courtney) of Charlotte; and seven great-grandchildren, Samantha Stahl, Trinity Stahl, Hadley Williams, Lawson Williams, Reeve Williams, Will Neuner and Rhodes Neuner. A family service will be held at a later date and burial will be at the New Bon-A-Venture Cemetery in Canton. Anyone wishing to sign the guestbook may do so by going to Wells Funeral Home in Canton. Memorials may be made to Canton First Baptist Church, 74 Academy Street, Canton, NC 28716. The family extends their appreciation to the staff of Silver Bluff Village for the love and extended care given during her residence there. The family is sincerely thankful for all the many friends and former students who continued to visit with her and remembered her in so many special ways during her stay at Silver Bluff Village.